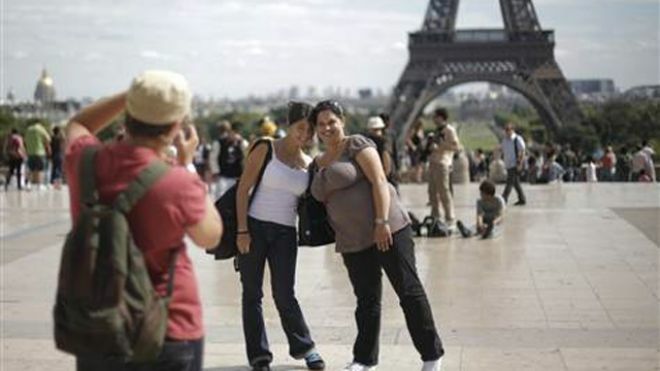 Tourists pose in front of the Eiffel Tower in Paris. Are we really the stereotype of the "ugly American" when we travel? According to a new survey carried out by LivingSocial and Mandala Research we seem to be. And worse, it was predominately Americans ranking their fellow countrymen. Released Friday, the survey polled 5,600 respondents from five countries– 4,000 of whom were Americans, says USA Today. Other respondents were in Australia, Canada, Ireland and the United Kingdom. The survey also revealed that four in 10 U.S. survey-takers said they’d stolen something – mostly towels (28%) and bathrobes (8%). Other popular items taken included pillows, remote controls, Bibles and sheets. So we’re not just rude when we travel, we’re thieves. The most common vacation disasters, according to American respondents, were: lost luggage on an airline (21%); bad weather (21%); and getting lost (16%). Americans weren’t the only ones to rank our own citizens as the worst tourists. Australians and Canadians also gave the U.S. number one spot. Surprisingly, Americans do travel abroad, which may be contrary to the stereotype of non-passport-holding Yanks. According to the press release from SocialLiving, 78 percent of Americans have visited at least one foreign country, 61 percent have visited multiple countries, and 36 percent have traveled to four or more foreign destinations.